There is no such thing as a fool-proof vegetable and there are no guarantees with any kind of gardening. The weather, critters, and mistakes can still make container vegetable gardening a challenge. The good news is that there at least 10 vegetables that are easier than most to grow in pots or containers. Among them are the nightshades like tomatoes, potatoes, peppers, and eggplant, and some that even kids would love to watch grow like peas and lettuce. The larger the container, the more potting soil it will hold, so the more margin for error you will have. A larger volume of soil will hold moisture and nutrients for a longer amount of time. Take a look at 10 vegetables that you can grow even if you do not have a patch of land for gardening but have some access to outdoor space with good sun exposure. 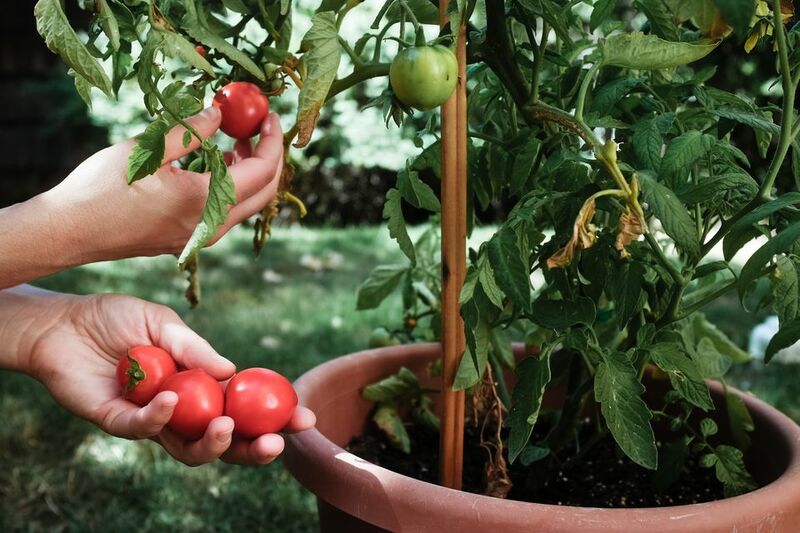 Tomatoes are overwhelmingly the favorite vegetable for gardeners to grow. Growing tomatoes in containers is easy and incredibly satisfying. There really is nothing like eating a tomato from your garden that is still warm from the sun. There are many ways of growing tomatoes—every gardener has their favorite—you can even grow them upside-down. There are a few things that you will need to know, no matter the variety of tomato that you decide to grow. 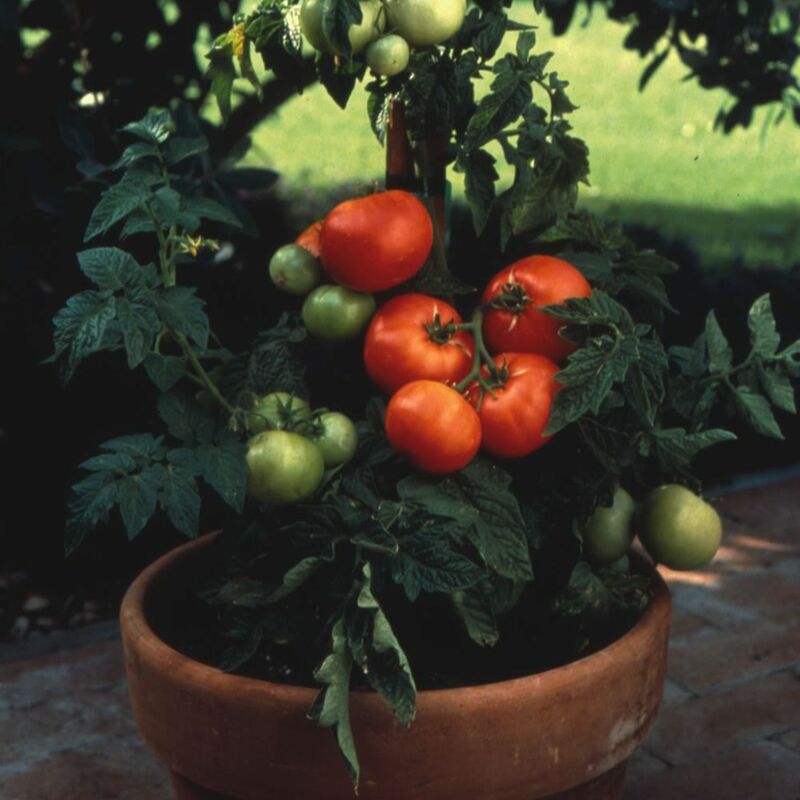 Tomatoes need great soil, plenty of sun, and consistent watering. Most tomatoes also are happiest in big containers and will need staking. This keeps the heavy fruit from bending and breaking the vines. ﻿If you are buying tomato seedlings, look for short, stocky plants that do not have blossoms yet. Tomatoes do not like to be cold so do not be tempted to put them out too early, they will just become stressed and will not grow as well. Your soil should be at least 55 F during the day and nighttime temperatures should not go below 40 F. Make sure to harden off or gradually acclimate seedlings to outside living well before you plant them. And, when planting tomato seedlings, plant them deep—much deeper than you would most plants. Peas are a great cool weather vegetable and stop producing when it gets too warm. They can be planted in early spring and then again when it gets cool in the fall. Peas are perfect for succession planting— so, plant them in early spring and then when it gets warm, and they are finished producing, pull them out and plant something else in that container. They actually improve your soil, by adding nitrogen to it, so your next batch of plants will have a leg up. Peas are also one of the best vegetables to grow with children. They are fast growers and super easy. Freshly picked potatoes taste totally different than the potatoes you buy. While it does take some effort to grow ​potatoes in containers, as well as a fair amount of soil and water, the rewards are fantastic. If you have never had a freshly dug potato, you are in for a total treat. They are also a great vegetable to grow with kids. Squash is an easy vegetable to grow and squash blossoms are beautiful and edible and expensive to buy. Most squash takes up a lot of space and will need a fairly large container, lots of light, good soil, and consistent watering and feeding. If you are going to grow winter squash in a container, make sure the variety you choose is not one of the giants. Those squash can weigh in at well over 20 pounds. Honeybear is an award-winning smaller variety of acorn squash and there are even tiny pumpkins you can grow. Growing lettuce and other salad greens in containers is easy, fast and gives you a bang for your gardening buck. You also do not need as much sun as most vegetables, and it is super easy to grow from seeds. There are all kinds of great salad green and mesclun mixes you can buy that are great for containers. Some are so beautiful, you can also use them in decorative pots, like Johnny's Elegance Greens Mix and Hudson Vally Seed Library's Mesclun Mix. Both hot and sweet peppers can be spectacularly beautiful, especially orange and purple sweet peppers in containers. They thrive in grow boxes but can be grown in any large container with lots of sun, good drainage, and consistent watering. Hot peppers come in all shapes, sizes, and colors. They range in spice level from mild to searing to hardly edible as measured by the Scoville Scale. Cucumbers are another popular vegetable to grow in containers and for good reason. They are crisper and tastier when freshly picked and they are pretty easy to grow. You can grow almost any cucumber in a container, but they vary widely in taste and disease resistance. Radishes grow ridiculously quickly and some varieties are gorgeous. Radishes can be grown in full sun to part shade. Keep in mind that they do not like to get too hot though. While the spicy taste of arugula leaves can be tasty, the flowers are to die for. They are sweet and spicy at the same time and are also beautiful. While some may not care for the texture of some edible flowers, arugula has a completely delightful texture and is really easy to grow. Eggplant is one of those great vegetables that also works as an ornamental. Some small varieties are very pretty and easy to grow. The flowers are gorgeous as is the foliage. Some strong eggplant variants to grow are fairytale and Hansel, which are both compact plants with beautiful and tasty fruit (eggplant is ​botanically considered a fruit). You can pick them really young or wait until they get a little larger. These varieties are both thin-skinned, so there is no need to peel them before you cook them.